Eating at work can seem like a no brainer, whether your food comes from an office vending machine, a corporate cafeteria, or the latest cookie tin brought in by a co-worker. But if you'd like more nourishing options, consider a more proactive approach to snacking on the job. 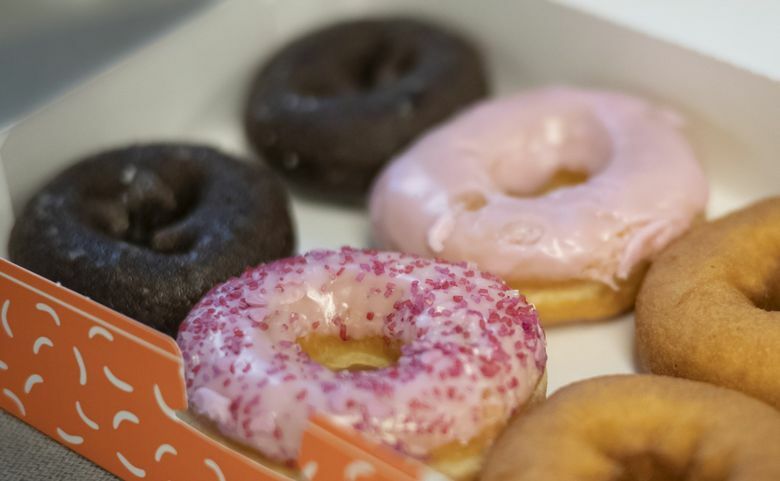 Breakroom doughnuts, the office candy dish, because-it’s-Friday pizza: Free food at work can feel like a great perk, but it can also be a cause of food anxiety if seeing food tempts you to eat — especially when employers or co-workers bring in food that isn’t exactly nutritious. Results from a nationally representative sample of 5,222 employed American adults published in the Journal of the Academy of Nutrition and Dietetics suggest that nearly one-fourth of us obtain foods and beverages while we’re at work, some from cafeterias and vending machines, but most of it simply free. College graduates were significantly more likely to forage for food at work. That may be because people with college educations are more likely to work for large employers, and large employers are more likely to have cafeterias and vending machines. In the Seattle area, that’s certainly true of companies like Amazon, Microsoft and Google. Whether free or not, food at work tends to be high in calories and sodium and low in fiber and necessary nutrients. Foods most commonly procured at work included pizza, sandwiches, cookies and brownies, regular soft drinks, burgers, breakfast sandwiches, doughnuts or pastries, burritos or tacos, chicken and potato chips. For those who partake once a week, that may be inconsequential, but if you rely on work food daily, it can add up. If you rarely hear the siren call of free food, you can stop reading now (or maybe share this article with someone who could use it). But for everyone else, here’s some food for thought. Do you tend to respond strongly to visual food cues? Before reaching for that cookie or slice of pizza, ask yourself if you’re even really hungry. If the answer is yes, ask yourself if that food will really nourish and satisfy you. If it won’t, ask yourself why you want to eat it. Is it because you’re stressed? Because everyone else is? Because it’s free? Just because it’s free doesn’t mean you have to eat it. Humans are wired to love a bargain, and bargains don’t get much better than free. But if you eat food you don’t particularly need — and maybe don’t even want, if you disengage autopilot long enough to make a conscious choice — there is a cost. Does this mean you should never eat cookies and pizza? If you enjoy those foods, of course not. But is the pizza you get at work really your favorite kind? Do you really like cake that has greasy, gritty frosting? And where would you rather eat a cookie? In a meeting, or on the weekend with a nice cup of tea or coffee? If you are relying on vending machines, dodgy office cafeterias, or cookie-baking co-workers for your workday sustenance, consider a new path. At a minimum, you’re going to need lunch and an afternoon snack when you’re at work (depending on your commute, you may need to add breakfast to that list). Accept the fact that you need to eat, and be intentional about it — not haphazard. This will likely involve some planning — deciding what foods to bring, shopping for them, remembering to pack them — but odds are you’ll satisfy your hunger better, and have a more energized afternoon.